Olen Steinhauer’s first two novels, The Bridge of Sighs and The Confession,launched an acclaimed literary crime series set in post--World War II Eastern Europe. Now he takes his dynamic cast of characters into the shadowy political climate of the 1960s. State Security Officer Brano Sev’s job is to do what his superiors ask, no matter what. Even if that means leaving his post to work the assembly line in a factory, fitting electrical wires into gauges. So when he gets a directive from his old bosses---the intimidating men above him at the Ministry of State Security, collectively known for the address of their headquarters on Yalta Boulevard, a windowless building consisting of blind offices and dark cells---he follows orders. This time he is to resume his job in State Security and travel to the village of his birth in order to interrogate a potential defector. But when a villager turns up dead shortly after he arrives, Brano is framed for the murder. Again trusting his superiors, he assumes this is part of their plan and allows it to run its course, a decision that leads him into exile in Vienna, where he finally begins to ask questions. 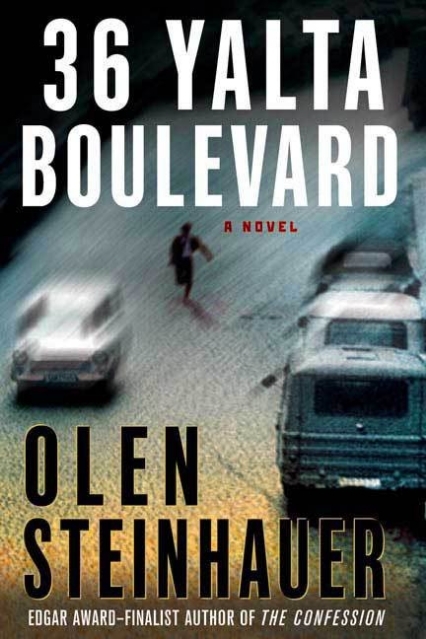 The answers in 36 Yalta Boulevard, Olen Steinhauer’s tour-de-force political thriller, teach Comrade Brano Sev that loyalty to the cause might be the biggest crime of all. [A] fine novel of murder and espionage. ... Highly recommended. Perhaps the finest spy fiction of the year came from Olen Steinhauer [...] who trumped his sensational first novel, The Bridge of Sighs, with the equally mesmerizing The Confession, has produced in 36 Yalta Boulevard, a spy novel that deserves to stand alongside the best works of Ambler, Greene and LeCarre. He may very well be the best espionage novelist writing right now. Steinhauer is a young American writer who spent time in Romania on a Fulbright listening closely to old stories of the worst of times, and he has now fashioned a precinct house all his own out of that world. ... His people are real, the crimes genuine, and he is telling larger truths about that era, making it unusually accessible. --David Halberstam, in LA Times' "Favorite Books of 2005"
How fascinating to see the iron curtain from the other side. ... it is a huge tribute to the author's skills that we can both admire and root for Sev as he works his way through the clever plot of this beautifully written spy thriller. Espionage novel is the height of intelligence...There was bound to be a line of pretenders to [Alan Furst's] throne, and one who has to be counted as a real contender is Olen Steinhauer. ... Steinhauer shows himself to be a master at plotting, with twist coiling upon twist, surprise on surprise. He is also very good at the kind of dialogue that appears to be open and above-board, but really hides shades of meaning. I found [The Vienna Assignment] exquisitely-written, full of well-drawn characters, and definitively explicated. If you like nothing better than a taut thriller in the vein of John Le Carre or Robert Ludlum, then add this book to your list of required reading. Thirty-Six Yalta Boulevard, like its namesake, is full of tricks; it is a brainy thriller motored by stylishness and brevity. Steinhauer evokes the baroque, bureaucratic nature of the Ministry without choking his readers on it, and he can render it humorous without being satirical. His characters, too, are subtle and biting. They are lonely and at risk, but they are beholden to a world more vast, secretive and calculating than they could imagine. That is comfort of a kind. The Vienna Assignment adds that rare commodity, political sophistication, to the spy thriller while taking readers back to the Cold War's deep chill. ... Oh, what a lovely read. The plots and counterplots are slowly revealed through Brano's tamped emotions, which render the charms of his love interest in Vienna oddly unnerving and his own brutal interrogations matter-of-fact. Indeed, more even than the swirl of hard-drinking émigrés in Vienna and the awful strictures of rural life back home and the strangely congenial symbiosis of watcher and watched, it is Brano who fascinates here. Le Carré's spies look almost floridly sentimental in comparison to this austere man, whose convictions carry him all the way to the subtle full stop of the book's last, quietly appalling moment. When people wonder, in a generation or two, what the Cold War was like and how we lived with it, especially in Eastern Europe, they can read 36 Yalta Boulevard. It's that reflective of the time, and that well written.... Steinhauer is a fine writer who not only understands what needs to be done, but knows how to do it. ...Sev, with an almost existential devotion to his idea of himself and his craft, is a revelation, and might eventually become this generation's George Smiley. 36 Yalta Boulevard [is] the third entry in Steinhauer's fascinating and original series. ... One reviewer ... compared Steinhauer to Graham Greene, but his latest is more in the Eric Ambler tradition of people in unwilling exile.